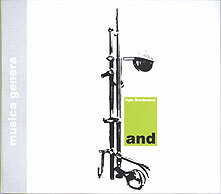 Kyle Bruckmann, oboe, English horn, suona, raita; in duos (as indicated by the titles) with Jim Baker, synthesizer; Jeb Bishop, trombone; Gene Coleman, bass clarinet; Fred Lonberg-Holm, cello; Scott Rosenberg, contrabass clarinet; Weasel Walter, percussion; Michael Zerang, multiple percussion. Recorded at Splinter Group Audio, Chicago on 26 and 29 March 2000. Design (front cover reproduced above) by Andreas Guskos.